The northern section of the Nile once entered Egypt a few miles north of Wadi Halfa, a Sudanese town that was completely rebuilt on high ground when its original site was submerged in the reservoir created by the Aswan High Dam. As a result of the dam’s construction, the Nile now actually begins its flow into Egypt as Lake Nasser. 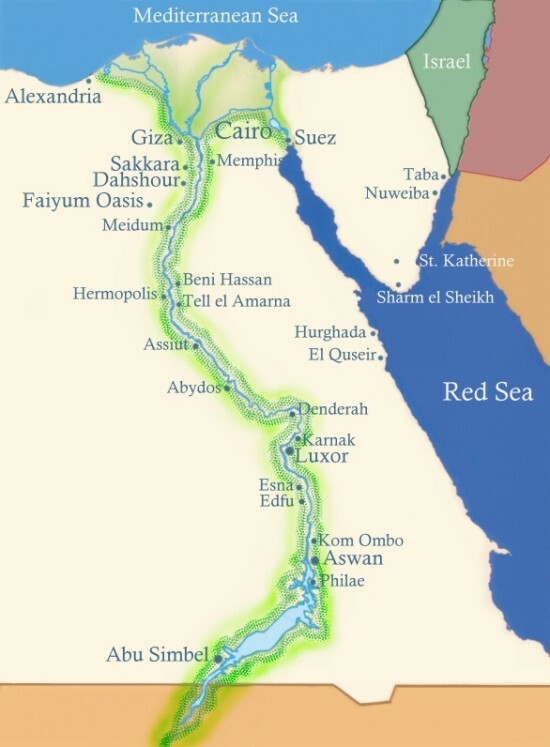 The Nile ends in a large delta that empties into the Mediterranean Sea. Nowadays the Nile Valley is a canyon running 660 miles long with a floodplain occupying 4,250 square miles. The Delta spans some 8,500 square miles and is fringed in its coastal regions by lagoons, wetlands, lakes and sand dunes. The civilisation of Egypt has depended on the river Nile since ancient times. Its long, narrow flood plain was a magnet for life, attracting people, animals and plants to its banks, and providing ideal conditions for the development of stable communities. Seen as a gift from the gods, the annual flooding of the river deposited nutrient rich silt over the land, creating ideal conditions for growing wheat, flax and other crops. It’s the Nile Valley which is holding now most remains of the vast heritage of Ancient Egypt.